Saswati is the Senior Programme Officer at Greentech Knowledge Solutions Pvt. Ltd and an architect by training who works on building design. She has previous experience with an architectural firm (Deependra Prashad Architects & Planners) and is a certified GRIHA trainer and evaluator. Saswati specialises in energy efficient building design, program management, building energy code development, and day-light analysis. She has a B. Arch from NIT, Bhopal and M. Plan from SPA, Delhi. The phrase “a roof over our head” often conjures up an image of a house as something that protects us. While traditional achitecture did focus on keeping a house comfortable by keeping the elements – like sun, winds, and rain – out, over time, the focus on thermal comfort has waned as architechture became generic and outdoor elements had less influence on the design of homes. This can clearly be seen in the case of air-conditioning. With air-conditioners getting more and more affordable, we forget to design our homes in response to our climate. Most homes today are not inherently designed for thermal comfort, leaving residents to “deal” with the heat or resort to air-conditioning. But, we do need to remember that most of India still cannot afford air-conditioning. 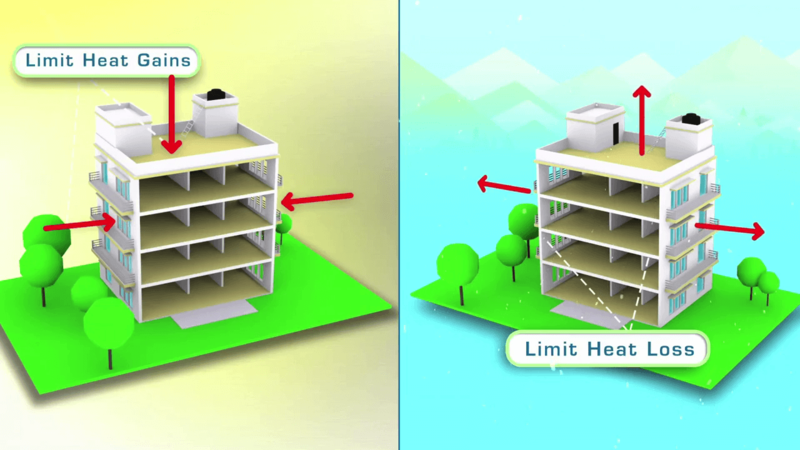 At the same time, making ACs affordable is not a viable option for an energy-efficient future. With this reality, we need to return to the forgotten focus on building design and the building envelope as the means to provide thermal comfort to the extent possible in the given climate. Orient your home considering the sun-path and wind direction. For e.g. In hot-dry and composite climates, longer faces of the building, including most windows, should preferably face north–south direction, to minimise solar exposure on walls. East and west faces get high solar radiation is summer. In warm-humid climates, longer facades, and windows, should generally be oriented at an angle (usually ±45 degrees) to the most prevalent wind direction. 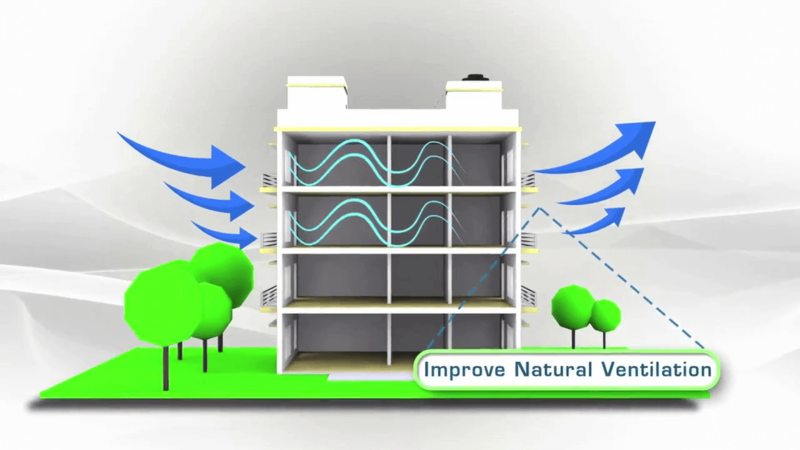 This is done to reasonably strike a balance between minimising solar exposure and improving air movement. In cold climates, longer facades of the building should preferably face north–south direction, to allow the low winter sun in winters while cutting off high summer sun. Insulate your roof. In hot areas, insulation will reduce the sun’s heat from coming into the living spaces from the roof. In cold areas, roof insulation will reduce heat loss from the space to the outside. Additionally, in hot areas, shade your roof or put a high reflective roof finish. Shading will reduce solar radiation falling on your roof. A reflective finish helps by reflecting off much of the sun’s radiation. An insulative wall will help in hot-dry, composite and cold climate zones of India. You can do this by using insulation material on conventional walling materials like brick walls and RCC walls; or use masonry blocks with better insulative properties, like Autoclaved Aerated Concrete (AAC) blocks to build your walls. In warm-humid regions, highly insulative walls are not very helpful as the day-night temperature difference is not much. Here, it would be better to have larger window openings to let in more breeze. Optimise your window sizes to allow enough daylight and ventilation. In hot areas, do not go overboard with your window glazing as they let in a lot of heat too. Shade your windows to cut off solar radiation in hot areas. For most of India, north and south faces can be adequately shaded in summer by a horizontal overhang or “chhajja”. For east and west faces, external shades that can moved (think bamboo “chiks” outside your window) work best. Seal your windows properly, especially in the cold climate where cold drafts enter homes. Use casement windows (or windows with hinges) instead of sliding windows. For the same window size, casement windows have more openable window area than sliding windows. Hence better ventilation potential. While thermal comfort is an essential requirement for any home, these simple rules are often overlooked for other superficial comforts. Keeping these points in mind next time you buy or rent a home, or while designing your home, can not only give you thermal comfort but can also help you save on your electricy bill.